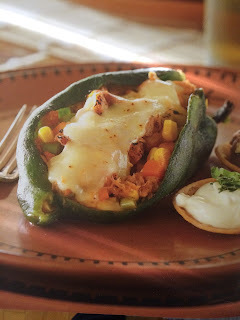 I love Chiles Rellenos. I cook them with black beans and cheese, with guacamole (a cold dish for Summer), with Mexican style ground meat, with plantain...name it. This recipe I took and modified a bit from the fantastic Susanna Palazuelos' book Mexico, una herencia de sabores, one of my favorite Mexican cooking books provided by my mother in law who adores me (what's not to love?). I feel sometimes that she gives me all these books knowing that I will feed her daughter properly. The current wife likes to eat... I like to cook. The perfect combo. This dish is easy to make. It is so easy that even my "cousin" can cook it...and that says a lot about the easiness of this recipe. The great thing about it it that is SO tasty that you won't believe it. Honestly is real comfort food. I serve it with White Mexican rice and some refried beans and always have some fresh bread and good wine (Barolo will do fantastic!). Give it a try and enjoy. You will be delighted to say the least. that I forgot to take the pic...mine looked better, though. 2. First we’ll prepare the stuffing: if you are not using canned corn you can put to boil in a small pot the water and add the corn (also you can add green beans) and let them cook for 10 minutes over high heat. Add 1/8 Tsp of Salt. Remove from heat, drain and reserve. 4. In a medium size frying pan warm up the canola oil over medium heat, then pour the tomato-onion blended mix and stir frequently. Add some seasoning (I use a beef Knorr cube). Keep stirring for about 10 minutes until thickens, then add the drained tuna and mix until incorporated. 6. Now we’ll prepare the Poblano peppers. Using your BBQ or a gas stove put the peppers to roast, moving them around so they don’t burn (they will blister, though). After roasting them, then put them in a plastic bag, close it and allow the peppers to sweat (30 minutes or so), then over running cold water carefully slice open each one and remove the seeds and the veins. Try not to break them otherwise they will leak the tuna mix. Put them to drain and reserve. 7. Now the stuffing part: using the palm of your hand take one Poblano pepper and carefully stuff them with the tuna mix until fully stuffed. Place it on a pre-buttered square baking dish. Repeat until all peppers are stuffed and on the baking dish. 8. Mix the two shredded cheeses and cover each stuffed pepper with a hand full until covering the stuffed part (if it spills cheese…even better). You might need more cheese if you are like me…I always for more cheese. 9. Bake for about 15 minutes or so. You will know they are ready when the cheese has melted and start to brown a little. 10. To serve: put one stuffed poblano pepper and sprinkle some creme fraiche. Serve immediately. You can accompany the Poblanos with some Mexican white rice and have ready a good piece of baguette… it will be unforgettable!